Having everyday and convenience food mixes on hand are a great way to save time (no running to the store for something to serve last minute guests) and money (brownies for $.50 instead of $1.50 or more) in the kitchen. Not to mention, making your own mixes allows you to control the quality and the ingredients making them adaptable to special diets or allergies. So where do you start if you want to stock your pantry with quick and easy mixes? First, look around your pantry and think about what convenience foods you would like to make mixes to replace. Do you love having brownies on hand for an after-school snack? Would having pancake mix on hand make Saturday morning breakfast more relaxing? Are you looking for a use for all those bread crusts the kids never seem to want to eat--turn them into bread crumbs or stuffing mix! Next, decide how you want to package your mixes. I use large glass jars that I keep on open bookcases in my kitchen. This works great for me because I have a long wall that not much else fits on it. Using quart and gallon size ziplock bags is great because you can stack them up, write the directions right on the package and they are pre-portioned. You can also put the bagged mixes in a plastic bin in your cupboard to keep them all together. Now the fun part, making all the mixes! Grab your apron and maybe even a couple of friends and have some fun! Buy your frequently used ingredients in bulk (flour, sugar, baking powder, etc.....) If you have limited storage space, gather a couple of friends for a mix day and split the ingredients. I can easily go through 25 lbs of flour on my mix days! Using a large, shallow bowl will make mixing your ingredients much easier. It allows you to see if your ingredients are thoroughly mixed! (I used a dishpan from the dollar store for years to make my mixes in before I finally bought a GIANT stainless steel bowl). Make sure your bowl is big enough to hold all of your ingredients and give you enough room to stir (flour showers are just not pretty!). A whisk makes quick work of dry ingredients. I keep a couple of different size whisks on hand for mixing my dry stuff together. When cutting in shortening, especially into a large batch, I have found the best tool is--my hands. I can feel the shortening mixing in and can scoop easily to the bottom of the bowl to make sure everything is fully incorporated. Making your own mixes allows you to control the ingredients. You can use all organic ingredients and still save over what an organic mix would cost you. Make gluten free mixes using an all purpose gluten free flour for a celiac friend (be sure all the other ingredients are gluten free also). Use a non-dairy dry milk powder for kids with dairy allergies. Leave the salt out for those with sodium or blood pressure concerns. It really opens up a lot of choices when you can control the ingredients. Sometime it takes a little experimenting, but it is worth it! Mixes are great for sharing with other families. A can of peaches (store bought or home canned) and a bag of cobbler mix with a carton of whipping cream is a yummy gift for a new mom or as a housewarming gift. Moms of toddlers love cookie mixes that require just the addition of and egg and milk as an easy rainy day activity! Mixes are great for camping! We fill a box with pre-measured mixes and only have to bring along a few extras (eggs, milk, water) in the cooler and we know we will be eating well. Some of our favorite camping mixes are: pancake mix (buttermilk or cinnamon oat pancakes), skillet scone mix, corn bread mix, quick cobbler mix (to use with fresh fruit from a local farmers market or picked straight from the tree), and tortilla mix, Our friends always tease us that we eat better when we are camping than they do at home. Mix together and store in airtight container. Preheat oven to 350 degrees. Grease an 8 inch square pan. Combine ingredients and mix until smooth. Bake for 30-35 minutes until center is set. Cool, cut, serve. *try adding mint chips for choco-mint brownies. Preheat oven to 375 degrees. Grease a 10" x 15" jelly roll or sheet cake pan. Put brownie mix in bowl. In small saucepan bring oil, water, and sour cream to a boil. Add to the brownie mix. Stir in eggs, sour cream and baking soda. Pour into pan. Bake for 20-25 minutes until toothpick inserted in center comes out clean. Prepare frosting and frost while cake is still hot. Well, we are back after a whirlwind vacation to MI to visit with family and friends. It seems like there is never quite enough time to see everyone and do everything that we want when we visit. Now that we are home, we have less than two weeks to prepare for our big party. We are celebrating our daughter's 16th birthday, our oldest son's graduation and finally having a housewarming party all rolled into one giant barbecue! When we moved into our house a year ago, the yard was suffering from severe neglect and we are trying to reclaim part of it from the overgrown wilderness--what a job! One of the things I have been trying to do is spruce up the entry to the house to make it feel a little more welcoming. If candlelight can add a welcoming glow to the inside of the house, why not the outside! This was a quick and fairly easy project and I love the way it looks! Nail or screw together the 1x2 pieces to form a U shape or a box (if you have 4 pieces). I was short on wood so I only used 3 pieces. Attach the U shaped piece to the 1x8, centering it on the board and making it flush with the back side. Nail or screw from the bottom side to hold in place. Attach the corbels to the outside edges of the board using nails or screws. Give the project a quick sanding and a coat or two of paint. Use a glass hurricane or candle holder inside the 1x2 box. Add a decorative candle ring for extra color. *If you use screws, be sure to pre-drill your holes to avoid splitting the wood. *I assembled mine using 1 1/4 finish nails in an air nailer and it is sturdy. I am already thinking of making another one for the other side of the doorway. I can't wait to decorate them for the party! 6/5/2011---I ended up making four of these to hang on our shutters on the back deck--I have already gotten tons of compliments! It seems like lately so many of my friends are discouraged and even overwhelmed with the task of parenting. They call out for help to those around them and are met with discouraging words like "it doesn't get any better" or "wait till they are teenagers" which does nothing more than sink their hearts a little further. I want to say --it doesn't have to be that way! God has a perfect plan for your life and each one of your children, He purposely gave you that child because He knew that you would be the best parent for that child! He doesn't make mistakes! So many have lost the joy and wonder they felt when they first held their little babies in their arms, that overwhelming sense of awe at the miracle that God had given them. Just remembering and viewing our children for the blessing and gift from heaven that they are can do so much to lift our spirits (especially on the difficult days). I am not making light of being a parent, parenting is HARD WORK! It requires us to constantly be on our toes and on our knees! We all have to find the balance between discipline and grace, consistency and flexibility while still being in tune with each child's unique needs and the circumstances are around us. It seems like one of the biggest things we have lost sight of is discipline. We have become a reward based society. It seems like every time someone asks for advice on how to deal with a specific behavior you read dozens of comments about sticker charts,rewards, bribing with candy, etc... Now, I am not saying that rewards don't have their place, they do, but ignoring bad behavior and rewarding what should be normal behavior (not screaming in public, not lying or throwing a temper tantrum) sets a dangerous precedence. The Bible talks much about the importance of disciplining our children, and also about the rewards we reap if we are willing to discipline our children (even when it is not popular). And to be clear, I do not think that discipline necessarily means spanking (that is a topic for some other time) but I am talking about discipline meaning " to bring to a state of order and obedience by training and control." (Websters dictionary). We need to be firm, consistent and even creative in our discipline. I love Proverbs 29:17--if we discipline our children, they will bring us the delights we desire! God's plan is always the best! Parenting is far more than just discipline and it is about teaching our children and turning their hearts to the their Heavenly Father who loves them more than we can ever imagine! 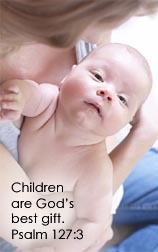 I want to challenge you to think of your children the way God does, as a blessing and a reward. To encourage each other with words of hope and not to drag each other down, especially around those new and young moms who so desperately need our encouragement! To offer Godly advice when asked and not worldly "wisdom". To be conscious of how you are speaking about your children to others both when they can hear you and when they cannot (this includes those exasperated facebook posts that your teenager can read!). May you find the joy in parenting! Spring has finally sprung around here and with the warmer temperatures comes the need for lots of ice in my family. The ice maker on our refrigerator is exceptionally slow and has a hard time keeping up with the ice demands. We decided it was time to dig out our portable ice maker and get it ready for the season, especially because we will be hosting a big cookout in a few weeks. Well, digging out the ice maker then required finding a spot to put the ice maker. Last year we never really found a place that we really liked, it seemed like it was in the way or too awkward to fill and empty. So what to do, what to do??? I decided to build a shelf to hold it! I wanted to be able to put it someplace out of the way (note: OFF the counter) and yet someplace where I could easily fill and empty it. While I was at it, I decided that having a place to keep all my teas and coffees together would be nice. So, the little blue hutch was born. All my teas and coffees are together and easy to find, plus I had room for some of my spice jars on the top two shelves which is great because I needed some more large jars on my pantry shelves. On the bottom I can fit my ice maker, grain grinder and my favorite bread tin which actually holds all my cookie cutters. I have a couple of other projects that are almost finished and will share as soon as they are done. One of them is a long promised Christmas gift that is finally finished. I want the new owner to see it before I share pictures. the builders labor in vain." One of the hardest parts of bulk cooking is keeping track of all the food once it's in your freezer! There is nothing worse than finding a meal that has been floating around the dark corners of your freezer for a couple of years, especially when you put so much time and effort into making the meal in the first place. I have tried many ways over the years of tracking what is in my freezer, but the easiest is to simply use a freezer inventory page. 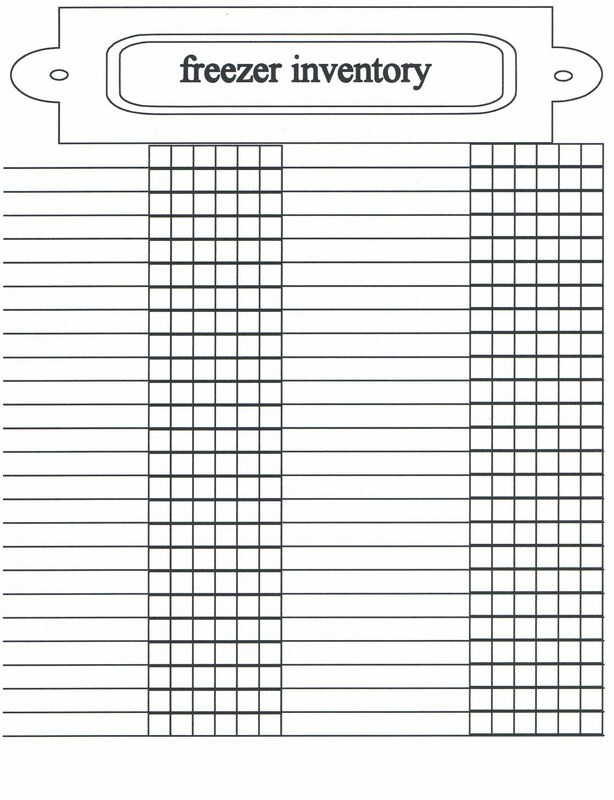 You can hang your page on the freezer, in the cupboard, on the side of your fridge or in your home management binder. 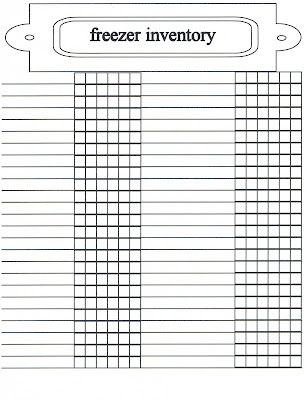 Placing your inventory in a page protector allows you to use dry erase markers to mark and re-use your page. You can also use a dry erase board, but I have found that things sometimes got erased by people bumping the board or a "helpful" toddler trying to clean up. To use the inventory, simple write down the entree or item name on a line and make a slash ( / ) mark for each item in the freezer. When you take the item out of the freezer make another slash to make an ( X ). This is useful for keeping track of all of your frozen fruits and veggies. No more digging around in your freezer wondering if there is really a bag of corn left for corn chowder, now you can know at a glance (provided you teach ALL members of the family to mark of anything they remove from the freezer) and no more frostbit fingers. Here is a printable freezer inventory just for you! Just click the picture to open, save on your desktop and print as a full page. I even use on of these sheets to keep track of all of my canned goods during canning season. It is great to know at a glance what I have without having to run around an open cupboard doors or running to the basement when menu planning for the month. Hope this helps you keep track just a little bit easier of all of your freezer contents! After what has been weeks of craziness, distractions and taking one step forward and two backwards, our bathroom is finally done!!!!! I feel like I kinda dropped off the face of the earth for a few weeks, and I am sure some of my faithful readers (I think I have a few ;) ) probably thought so too. There has been much "busyness" in our lives lately--with three teenagers, preparing for some big parties next month and trying to get the house projects done, plus finish up the school year, prepare for a trip home to visit all the grandparents and generally keep up with life and everything else going on, I had to set some things aside for a bit. So, here it is, one of the projects that has been keeping us occupied for the last few weeks. One of the main reasons we started this remodel was the bathtub had quit draining. We ended up having to cut out pipes to clean them out, they were completely blocked. Also the bathtub only held about 6 inches of water when you were in it--that is NOT a bath to me! I also really disliked the 80's linoleum, vanity and medicine cabinet. We choose a narrow European vanity that makes the room feel so much larger! We also went with this amazing flooring that looks like wood, but is waterproof. It has a really great feel and makes the room so warm and inviting. I LOVE my extra deep bathtub. We actually purchased another bathtub first, but ended up returning it when we found this one. We had to special order the surround for it, but found a good deal through one of the local hardware stores. The worst part of this whole project was that every time we thought we were making progress, something would go wrong and set us back. When we installed the vanity, the shut off valves all started leaking and we had to take it completely back out, cut a hole in the wall and replace the parts-- which was pretty much the way the whole project went. I am very grateful to finally be done! I still would like to find a piece of artwork or shelf for the wall over the toilet and I have plans to weave a bath rug and some hand towels, but for now, they will have to wait. I am back, and I am sorry if I have missed a comment, I tried to check them occasionally, so please forgive me. I have some new projects and lots of recipes planned to share in the weeks ahead. 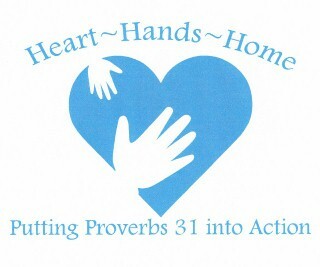 Grab a cup of coffee, pull up a chair and join me on this journey to put Proverbs 31 into action. Women are the hearts and hands of their home! May your heart be content, no matter what circumstances you face. May your hands be busy, caring for your family and reaching out to those in need around you. And may wherever you live, become a haven to everyone around you, not just a place to lay your head, but a home.